The following is a collection of blog entries I posted in the spring of 2013. As usual, I have maintained the casual tone of a blog to whatever extent that was possible. I've made a few corrections from the blog version. Chances are good that I shall amplify this site over the next little while. It can use some more positive argumentation for the early date of the exodus, and eventually, after an appropriate time, I can add information specifically on Akhenaten, who sparked the whole line of thought. For the moment, I hope you can read the article when it comes out. Time to hang out my "workshop" shingle again. In case the phrase is new to you, I'm borrowing it from F. Max Müller, who was Professor of Comparative Philology at Oxford in the nineteenth century. He spent most of his time translating the Vedas and Upanishads, as well as editing the 50 vol. Sacred Books of the East. Every once in a while he would get away from that routine and write an article arising from his purely language-focused study that would have to do with the origins of various myths and their connections. These he would then eventually publish in anthologies that went under the title of Chips from a German Workshop. There were five of those collections of "chips." Given a choice, I would suggest starting with vol. 2, which contains some famous essays. Müller and his ideas constitute an entire chapter early on in my upcoming book on original monotheism. -- Anyway, I made use of Müller's phrase quite a bit last summer when I was immersed in research and writing and posted some tangential items on the blog, and will do so again for a bit. So, what's been keeping me occupied so intently over the last little days? Actually, it's no huge deal, such as a book, just another article for the Lexham Bible Dictionary, which is published by Logos. Currently I have two little pieces in there: articles on "Baal" and "Warfare in the Old Testament." This time I'm working on Akhenaten, the Egyptian pharaoh. When I saw the list of potentially available articles, it's the one I really wanted to write because I've been fascinated by him ever since as a kid (around ten I guess) I got a copy of C. W. Ceram's Gods, Graves and Scholars for a Christmas present (in the original German, of course). I also included a fairly short section on him in In the Beginning God, the book on original monotheism that is scheduled to come out in August. But for this article I've just let my scholarly enthusiasm take over, reading numerous books, and even trying to follow some hieroglyphics--with little success. I'm obviously not going to tell you here what I'm writing on this Pharaoh in the article or have written on him in the section of the book, but I can give you a little background. Back in the old days, meaning my youth, Akhenaten was frequently referred to as "Reformer." The popular picture went on: Decrying all previous gods of Egypt as false, he insisted that there was only one deity, namely Aten, which was the disk of the sun as a representation of pure Light, and he prohibited worship of all other gods. He built a city, which he called Akhetaten ("The Horizon of Aten") at the site known as el-Amarna, where the famous "Amarna tablets" were found. The artwork at Amarna was unique in its attempt to be more life-like and less stilted than Egyptian art tended to be, and it is known for its focus on the family: Akhenaten, his beautiful wife, Nefertiti, and their six children, all daughters. People called him the "first individual," by which they meant that he was the first human being who drew his own conclusions concerning religion rather than going on the authority of tradition, and his station as the "first monotheist" seemed to be beyond question. He wrote a hymn to Aten, they said, that eventually may have influenced David in writing his psalms. From there, it was, of course, a short step to the speculation that Moses learned about monotheism from him, an idea that Sigmund Freud, who never let facts get in the way of his speculations, exploited in his Moses and Monotheism. (Freud even consistently "corrected" his patients with regard to what they had experienced in order to suit his analysis). How much truth there is to this description I won't disclose to you now. I am, however, convinced that, regardless of what scholars will advocate over the next few generations, on a more popular level this description will continue to be accepted with a life of its own, similar to how Wellhausen's long-discredited theories continue to be taught as staple in colleges and seminaries all over this country. However, even though I will not go any further with Akhenaten himself, let me put him into the sequence of Pharaohs surrounding him. As you may know, the history of ancient Egypt is generally divided into four major "Kingdoms" (Early, Middle, New, Late), divided by three intermediate eras, and followed by the Greco-Roman period. Within those periods, there are dynasties, viz. generations of kings from the same family, some lasting longer than others. Akhenaten belonged to the 18th dynasty, which led off the new kingdom after the expulsion of the invading foreign kings, usually referred to as the Hyksos. This dynasty may have had 14 pharaohs and lasted perhaps from 1550 to 1307 BC (the Egyptian chronology is far from settled). "Pharaoh" is the title of the Egyptian king, and its etymology takes us no further than the literal phrase "Great House." I would distrust all speculations as to why the king was called "Great House." It may be because he lived in a palace, but that notion seems too insipid to me to provide the root a major title. The Pharaoh was always considered a son of one or many gods, and--at least in principle--was the only legitimate high priest to the gods. Practically, there was, of course, a large priestly class, serving on his behalf. Anyway, let me tell you a little bit about the eighteenth dynasty. Part of the reason why you should know about the eighteenth dynasty is because the non-evangelical scholarly world is so set on the Exodus having occurred, if at all, during the reign of Pharaoh Rameses II of the nineteenth dynasty during the thirteenth century BC, a time that squares neither with the biblical chronology nor the events connected to the Exodus in the biblical narrative. Some evangelicals, such as Kenneth Kitchen, have bought into that date as well, and doing so does not mean that their faith or scholarship is compromised, though they are making, in my opinion, a serious mistake. As long-time readers know, I advocate as one of my fundamental principles that modifications of major components of any narrative in order to find a slot for it in history vitiates the attempt. Such is the case, as far as I can see, with this "late" date for the Exodus. The 18th dynasty began with Ahmose, who brought the rule of the Hyksos to a final end and gave credit to the Egyptian god, Amun, whose main cultus was located at Thebes in the southern part of Egypt. The other major collections of temples were at Heliopolis, where the main god was Ra, the sun god, and Memphis, the administrative capital of Egypt, where Ptah, the god of wisdom was the central object of worship. These three centers all incorporated various other pan-Egyptian gods, such as Osiris, the god of the underworld, and Isis, his wife and a goddess of nature. Ahmose was succeeded by Amenophis I (Amenhotep I), who enjoyed a stable and peaceful reign without much known concern for foreign policy. However, his successor Tuthmosis I elevated Egypt to the status of a world power, expanding into Syria and Palestine all the way to Mesopotamia as well as deep into the south. 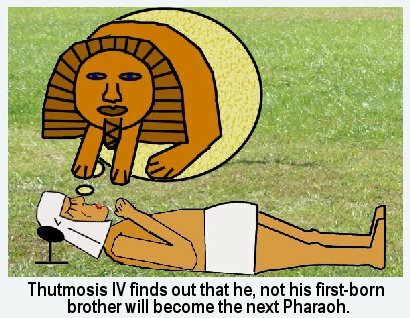 The next pharaoh Tuthmosis II did not share his father's ambitions and died while he was still quite young, leaving a small child, Tuthmosis III, as the next occupant of the throne. The fact that he was the son of one of Tuthmosis II's lesser wives, leads us to the conclusion that his chief wife, Hatshepsut, had not given birth to any sons, though she had a daughter. Needless to say, because Tuthmosis III was still a little toddler, he needed a regent on his behalf, and that office was taken up by Hatshepsut. Hatshepsut herself came from the lineage of Pharaohs, most likely a daughter of Tuthmosis I and, thus, half-sister to her husband, Tuthmosis II. Thus she was also "Pharaoh's daughter." (As we know, marriage between brothers and sisters in the royal line was an accepted and popular way of trying to keep royal power within one family in ancient Egypt). Hatshepsut was a strong-willed woman who did things her own way without regard to the opinion of her peers. For example, the idea that she would flaunt the established policy of oppressing the Hebrews living in the Nile Delta fits in well with her personality. It would be quite natural for her to, say, upon finding a little Hebrew baby, give him an Egyptian name and raise him as her adopted son. We don't know that she did so, but we can easily picture her doing so. Before becoming Pharaoh's wife she had been "God's Wife" at the temple dedicated to the god of hidden power, Amun, in Thebes. Now as regent, Hatshepsut decided, not without grounds or precedent, that she really was entitled to be considered Pharaoh herself. 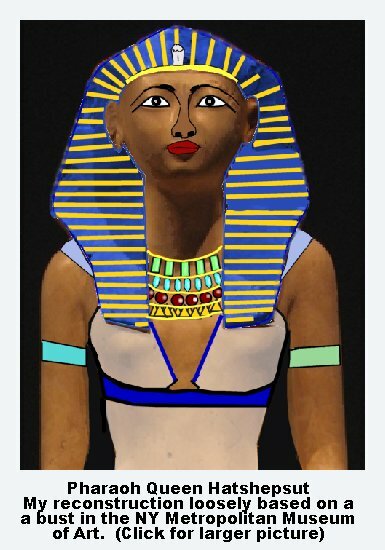 She appropriated for herself all of the typical regalia for a Pharaoh and even let herself be pictured with the little extra beard that adorned a Pharaoh's face. Tuthmosis I, great conqueror; father of Tuthmosis II and of Hatshepsut. Hatshepsut, daughter of Tuthmosis I, chief wife of Tuthmosis II, former priestess of Amun, regent for Tuthmosis III, self-declared Pharaoh. As Jay Kesler says, "A word to the wise is unnecessary." Still, in case you didn't notice that this is part 2 of I don't know yet how many, I would like to suggest that you begin with part 1 above. Let me continue for a little while with sweeping up chips that have fallen to the floor of my workshop and select some usable wood shavings. In the process of immersing myself in studying Pharaoh Akhenaten, I've learned a lot about the 18th dynasty of Egypt, the first of the New Kingdom, and I'm in the middle of telling you a little bit about it. Please note that I've added a couple of small details to last night's entry as well as corrected some spellings. 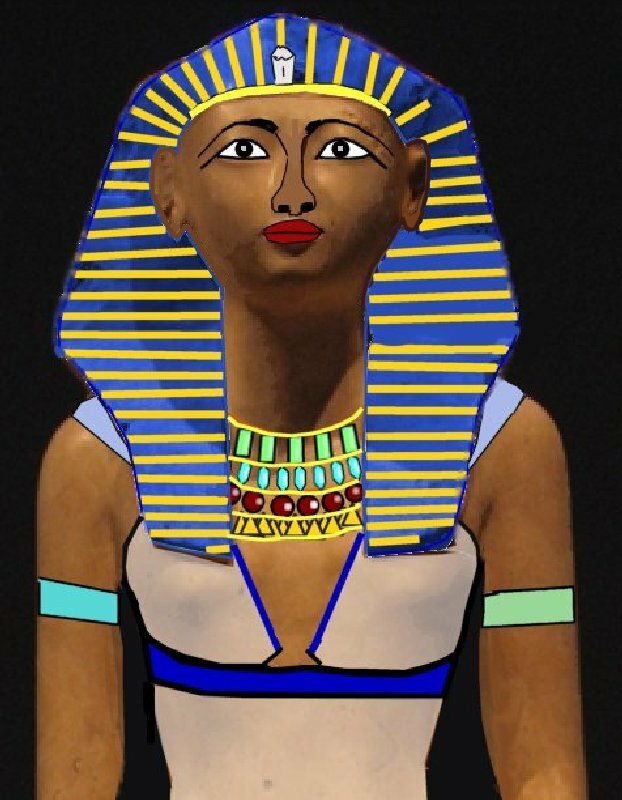 We left off with the multi-talented Queen-Pharaoh Hatshepsut, daughter of Tuthmosis I, widow of Tuthmosis II, regent for Tuthmosis III, Pharaoh by the divine favor of the god Amun, whom she had served for a time as "Wife" and priestess. Now, Nicholas Reeves (Akhenaten: Egypt's False Prophet, 2005) argues that phrases such as the one I just paraphrased from Hatshepsut, i.e. "Pharaoh by the divine favor of Amun," were inappropriate for a Pharaoh and would cause a lot of trouble later on. A Pharaoh is a Pharaoh because he is supposed to be a Pharaoh, and he maintains the country's relationship to the gods. A god may even prophesy to someone that he is going to be a Pharaoh in the future, but the office of Pharaoh is not (supposed to be) dependent on the approval of a specific god. The reason lies partially in political pragmatism because--for all practical purposes--that concept implies that ultimately the priests of the god have the power to bestow Pharaoh-ship on a person, much as the pope traditionally crowned the German emperors. Acknowledging Amun's favor per se would have been fine, but stating that one is Pharaoh because of the support of a specific god is presumably going too far because saying so just put too much power into the hands of the priests. And there can be little question that Hatshepsut established her position thanks to her affiliation with the temple of Amun. In addition to the complaint that relying on divine support supposedly decreased the status of a Pharaoh, an overemphasis on Amun could also cause friction with the other two major temple complexes, the Ra-sanctum at Heliopolis and the Ptah facility at Memphis. There had been some recent attempts at compromise, e.g. Amun became popularized as Amun-Ra, but those did not accomplish much. Each group of priests was looking for a door to more power, and Hatshepsut had just handed the priests at Thebes (where her daughter was serving as "God's Wife" now) a huge opening. Despite these underground grumblings, Pharaoh Hatshepsut turned into an outstanding queen. Her reign was marked by continued prosperity on the whole, and during her time on the throne, there were some successful military excursions, probably headed up by her charge, Tuthmosis III. When the boy became old enough, the regency turned into a co-regency of two Pharaohs, a relatively common occurrence in Egyptian history, practiced in order to ensure a smooth transition. However this co-regency was probably longer than most. After ruling for twenty-two years (perhaps) Hatshepsut passed away and received a royal burial. Tuthmosis III was now on his own and made use of what he had learned during his "apprenticeship," so to speak, to become an extremely powerful and effective ruler. Counting the time of the co-regency with Hatshepsut, he was on the throne for more than fifty years (54 is the currently popular number). I might just mention, not-so-in-passing, that Ramses II (the "Great") ruled even longer. His reign lasted sixty-six years. Ramses II, as I mentioned last night, is commonly said to be the Pharaoh of the Exodus, but whoever thought up that association committed a serious flaw in their thinking, at least as long as we do not whittle away at the biblical narrative so that we can cram it into that time slot. There must have been at least two crucial Pharaohs in the life of Moses; there were more, but two were essential to his story. There must have been one whom we can call the "Pharaoh of the Oppression" and one who served as the "Pharaoh of the Exodus." The Pharaoh of the Oppression did not start enslaving the Hebrews, but he enforced the practice throughout his reign. It was during his time that Moses killed an Egyptian man and then fled, spending the next forty years in the wilderness. He did not return to Egypt until God sent him back once this Pharaoh had died and a new one, the Pharaoh of the Exodus, was on the throne. Now, if Ramses II was the Pharaoh of the Exodus, as is commonly asserted, the Pharaoh of the Oppression would have been Seti I, who only ruled nine years. As Gleason Archer liked to say, Moses could not have spent forty years in the wilderness during those nine years. And if we were to go back multiple Pharaohs, adding up to forty years prior to Ramses II, that would take us back to the time of the accession of Thutankamun ("King Tut"). If we then assumed that the incident that caused Moses to flee did not occur immediately at the beginning of a Pharaoh's reign, it would have to have occurred during the Amarna years, which is impossible in so many ways, I can't count them. Not that anyone seriously advocates that option, but it does not begin to hold any water. Nobody fits the possibility of being the Pharaoh of the Oppression better than Tuthmosis III. He was powerful, self-assured, ruthless, and the circumstances surrounding his reign don't force us to change any aspect of the biblical narrative. He reestablished the dominance of Egypt over the Levant with a powerful army and would not have given a fig for the wishes of a group of Semites who were serving as slaves in the Nile Delta. He considered this northernmost area of the country to be a nice buffer zone between Egypt and the countries further north, such as the Hittites. If they wanted to invade Egypt, they would first of all have to work their way through the two million or so Hebrews living in that slave colony, giving him some extra time for his response. Now, we need to do some hypothesizing. For all that we know, Hatshepsut and Tuthmosis III appeared to have had good rapport during their lengthy co-regency, with Tuthmosis by and large subordinating himself to the queen if necessary. However, late during his reign, quite a while after Hatshepsut's departure into the underworld, he ordered that her name be erased from all public inscriptions and whatever documents there may have been, making it appear at least superficially that Hatshepsut had never existed, let alone been Pharaoh. Such ex post facto purges had happened both before him and would do so again after him--none with the vehemence with which Akhenaten would eventually be dis-remembered--and this particular one was actually fairly perfunctory, but it was effective. We must ask what motivated him to do so? Such measures were obviously taken in order to obliterate the name of a predecessor with whom one had a strong disagreement. The problem is that it is difficult to isolate where that rather late posthumous disagreement with Hatshepsut may have lain. There doesn't seem to have been any major tension between them on any issues, of either foreign or domestic policy during her lifetime. The fact that she was a woman was not an issue. There were female Pharaohs previously. Two possibilities come to mind; one is slim, and the other one is slimmer. To whatever extent Hatshepsut may have been thought to have sold out to the priesthood of Amun, Tuthmosis III may have decided that he needed to cut those bonds and reassert his independence by publicly establishing a distance between himself and his onetime co-Pharaoh. I'm also wondering (and this is the very slim option) whether, as Tuthmosis III was dealing with the Hebrews in the north, he felt that he needed to assert his dominance because Hatshepsut may have been too lenient in that matter. Admittedly, this is a weak guess, but it may be a tiny part of a potential explanation. The son of Tuthmosis III, Amenophis II (Amenhotep II), would then be the Pharaoh of the Exodus. Amenophis carried on his father's policy of military ventures into the Levant--until some time during his tenth (or so) year on the throne, out of a total of about twenty-five. At that point, he abruptly ceased all military activity. It was as though his army had totally disappeared, and he began to negotiate for peace with his former enemies. For a long time, even under later Pharaohs the "Egyptian" army consisted primarily of mercenaries and recruits from surrounding areas, such as Libya and Nubia. One might think that the irresistible Egyptian army had suddenly drowned in the Red Sea. There was no war during his last fifteen years, nor during the time of his successor, Tuthmosis IV. I don't know how many times I've heard or read people bring up the point that an event of such great calamity would surely have been recorded by the Egyptian historians. One's first reply would have to be to inquire which historians the objector might have in mind. Egypt did not have historians until late into the Ptolemaic era (after Alexander the Great), and they did not posses very good records to go on. Remember what I just said about Tuthmosis III trying to erase references of Hatshepsut from public awareness. I added that, compared to the post-Amarna purge, what he did was relatively superficial, but it was still effective. It was a long time before anyone was able to put together her role or her importance, particularly the fact that she actually reigned as Pharaoh. In contrast to some other civilizations, Egypt did not maintain chronicles of important events. The written sources that historians use are fictional stories that shed light on attitudes and events, business records, correspondence on papyrus and a few tablets, and a myriad of inscriptions. Inscriptions on tombs, in temples, on and in houses, on columns, alongside pictures, these are what provide us with the written history of Egypt from an Egyptian point of view. And that last phrase, "from an Egyptian point of view," is the most notable matter of concern. In fact, when I say, "from an Egyptian point of view," I mean specifically the point of view of the person, say, a Pharaoh, who ordered the inscriptions to be made. And that meant that the inscription had to not just be favorable to the Pharaoh, but to glorify him. Exaggeration was the rule. The so-called chronicles of Pharaoh's were essentially propaganda. The Pharaoh was credited with the deeds of his underlings, his predecessors, or persons out of the scribe's imagination. He received praise for the victories his army had won, even if he was not a part of the campaign, and even if there was no campaign. Pharaohs too young to shave or to grow the ceremonial beard were lauded for having single-handedly slain hundreds of well-armed professional warriors. They hunted so successfully that one would wonder whether any antelopes could be left in Africa. Ramses II led his army into Syria in order to rein in the expanding Hittites. The end result is often called a "draw," but the Pharaoh did not achieve his aims, and so, for practical purposes, he lost. Still, his monuments declared his great victory, and, according to a former student, to this day Egyptian schools teach the success of Ramses II in this campaign. In short, most of the writings, particularly the inscriptions, are pure propaganda that no one could (or should) accept unquestioningly as true. Needless to say, a necessary implication of this approach is the policy of never ever recording anything negative, unless doing so is ordered by someone's enemy, and even then the program of deliberate self-exaggeration at the expense of the enemy, as well as the truth, would be the rule. In short, the idea of anyone in Egypt recording the calamities of the ten plagues followed by the destruction of the army in the Red Sea is, if I may use the word, "inconceivable." If Amenophis II was the Pharaoh of the Exodus, then he was the one who received all of the plagues from God, including the death of his first-born son. Again, we would not expect the Pharaoh's scribes to mention such an event, but we are not without evidence for this occurrence. We'll save that for the next entry. Who was the oldest son of Amenophis II (Amenhotep II), and what happened to him? Remember now that we can fit the story of Moses rather nicely into the reign of Tuthmosis III, part of which he shared with his aunt and stepmother, the Pharaoh's daugher, Hatchepsut. Tuthmosis III is suited uniquely to be the Pharaoh of Oppression who perpetuated the enslavement of the Hebrew people, and during whose reign Moses killed a man and escaped to spend forty years in the desert. Moses did not return until Tuthmosis had died and a new Pharaoh came to the throne. That would have been Amenophis II. We mentioned that the Egyptians did not proclaim their losses or pass on a record of them to posterity, so that we should not expect them to leave any references to the Exodus. However, there is startling confirmation for the event in that from the tenth year of his reign, Amenophis II suddenly ceased all military activity and established peace with his enemies. Had he become a pacifist? That is doubtful; more likely he lost his army, an initially strange idea, but one that fits later events like the proverbial hand in the glove. And then there is the matter of the missing heir. The Egyptian records make it clear that Tuthmosis IV was not initially on the way to becoming Pharaoh. Let me make up a name, "Tutophis," for the crown prince. In reality we do have some, but utterly unexplained, references to a number of names of men who could have been his brothers, but they are unanimously unclear. Most of the actual records, insofar as there may have been any, apparently went to the embarrassment prevention shredder, and some of them have only been re-deciphered by modern scholars from destroyed inscriptions. So, again, we cannot expect the "Heliopolis Daily Papyrus" or the "Memphis Evening Inscriptions" to herald the headline that "Tutophis" the crown prince and eldest son of Amenophis II, was killed by the angel of death, who visited the the Egyptians when the Hebrews vacated Egypt under the leadership of Moses. There are many people who, if something bad has happened, don't want to talk about it, and the old Egyptians raised that psychological difficulty to a science. It is clear that "Tutophis" was waiting in the wings, but he disappeared, and what's worse yet, the story was so astonishing and embarrassing;that a simple made-up substitute explanation would not have worked. According to the biblical record, other people lost their firstborns as well, and must have been equally as dumbfounded, if not more so. The Egyptian means of handling the disaster was to stop mentioning his name, expunge it from the records, treat him as though he had never existed, and, if he had never existed, he could not have died in this unsettling manner either. That's what most likely happened to him and probably numerous other young boys. But even that approach was not all that easy to follow through on. It's one thing to know that someone died, hold a major funeral service for him, and then to designate the younger brother as the new heir. But when the whole thing happened in this simultaneously shocking and mysterious manner, the question of succession became more dubious. It is clear that, when Amenophis II ceased eating grapes handed him by his concubines and started to make the acquaintance of Osiris in the underworld, Tuthmosis IV took the throne, and the Bible gives an explanation for why the earlier crown prince was gone. But by that time the ten plagues were already fifteen years in the past, long enough for conspiracy theories to have replaced many a clear memory, and the new Pharaoh felt compelled to justify his new position. Keep in mind what I said earlier with regard to Hatchepsut invoking Amun's support for her role; this is not something that is usually done. The tale told by Tuthmosis IV, just by the fact that it came into existence, demonstrates that there was a highly unusual set of circumstances in connection with the disappearance of the older son, even if they were not specified by the superstitious Egyptians. His claim was that he was now on the throne thanks to a joint prophecy made by all of the gods who were present in the Sphinx. 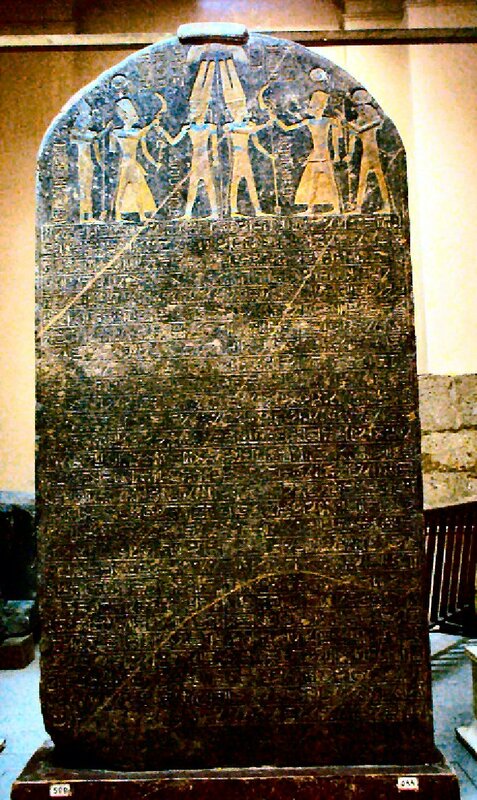 He recorded his narrative on a stele. Tuthmosis IV told the story that when he was younger, he was busy in the vicinity of the Sphinx. If necessary, princes usually found work as priests, which often was combined with the duties of a scribe, and so Tuthmosis may have been hanging around the area of North Egypt in some capacity along that line. But he also found time to hunt and play. One day, as he had been pursuing his recreation in the hot sun, he got weary and decided to lie down to take a short nap. Once he had fallen asleep, the Sphinx came to him and spoke to him. She identified herself as the combination of all of the gods, light and dark, sun and moon, etc. and told him that he would become pharaoh. However, there was one condition attached: He needed to clear out all of the sand that had accumulated around the Sphinx and restore her to her previous beauty. If he did so, the kingdom would be his. Tuthmosis IV told this story often enough that people accepted his kingship, and troubling questions concerning his older brother did not need to be brought up. At the risk of belaboring the point, there have been more than a few instances where a younger brother came to the throne rather than the oldest son, who had been heir apparent. What sets off this occasion is the mysteriousness with which the disappearance of the older brother is treated, namely in the typically ancient Egyptian way of covering up an embarrassing defeat, which is underscored by Tuthmosis IV coming to the throne almost apologetically relying on the story of the dream to legitimize his reign. Amenophis III: 38 years (with some serious questions concerning co-regency). We have roughly 60 years or so leading us to the reign of Akhenaten. If we begin counting the Exodus at the tenth year of Amenophis II, then we have sufficient time for Israel's forty years of walking in circles in the wilderness and engaging in the conquest of the Promised Land, first in the east under Moses, and then on the western side under Joshua. It was primarily during Akhenaten's time that the cache of tablets from Canaanite princes containing pathetic cries for help against the "Habiri" were accumulated. We can revisit those next time. Final liberator from the Hyksos. Reigning over the new-found peace and stability. Son of Tuthmosis I. No particular legacy, died young. Married to Hatshepsut. Daughter of Tuthmosis I. Chief wife of Tuthmosis II, former "God's Wife" at Thebes, regent for Tuthmosis III, self-declared Pharaoh. 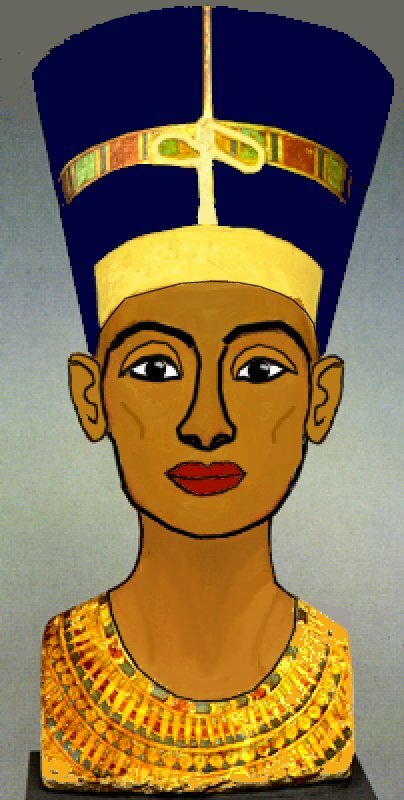 Son of Tuthmosis II, early lengthy co-regency with Hatsheptsut, reigned more than fifty years, strong military exploits, the "Pharaoh of the Oppression." Son of Tuthmosis III, reigned for about twenty-five years, broke off all military activity after his tenth regnal year, or so. The "Pharaoh of the Exodus." Became designated for the throne unexpectedly after the mysterious death of his older brother, the first-born of the family. Justified his divine call to be Pharaoh on the "Dream Stele." No significant military activity. Reigned over a time of apparent peace. No major or significant military activity. Compensated for not expending his testosterone in warfare by maintaining a huge harem. Wife: Tye. Made Aten, the disk of the sun, the center of Egyptian religion. Built Aketaten as his new capital. Receiver of the majority of the Amarna tablets, many of which were desperate or irritated requests for help or gold from Egypt's vasals. The military, such as it was, worked on his building projects. Wives include Nefertiti and Kiya. Introduced a new, more intimate and dynamic version of art. Mysterious successor to Akhenaten and possibly co-regent. He and the appearance of his mummy have long been a puzzle to Egyptologists. I can't wait to tell you about him! At a minimum, softened Akhenaten's measures. "King Tut." Began his reign in Akhetaten; left, changed his name to Tuthankamun, thereby honoring the former god, issued a reform edict to undo all the changes Akhenaten had imposed. Nevertheless, as excluded from most lists of kings because he was associated too closely with the "heretic king." Not directly of a Pharaonic line, but the best candidate after Tuthankamun's untimely death, related to several queens. Not of a Pharaonic line, chief general of the country, returned to military measures, initiated a fanatic campaign of obliterating the memory of all Pharaohs from Akhenetaten through Ay. The nineteenth, "Rameside," dynasty commences. Let's get back and pick up some things from the workshop floor concerning ancient Egypt, and-- specifically--the 18th dynasty. Something occurred to me as I have been studying. Much of what we know about ancient Egypt, as I've mentioned, comes from inscriptions, but oftentimes the interpretation of pictures also plays an important role in trying to put together the history. The depictions of gods are fascinating, and--in case you're wondering--it really is true that nobody has a plausible conjecture as to what animal the picture of the annoying deity Set is supposed to be derived from. But with a little help you may be able to puzzle out who in a picture is supposed to be a Pharaoh. For one thing, it's a matter of size. With a few exceptions, Pharaohs, their wives, and gods will be the largest figures in the illustration. Other important people get to be medium height, while common people and enemies are rather small. 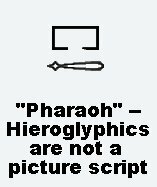 Second, if you're looking at an inscription in hieroglyphics, the name of the Pharaoh will be surrounded in an oval, called a cartouche. This is one of the devices that helped Champollion in his work of deciphering the script. It seemed natural to him that if any words were important enough to receive that kind of decoration every time they appeared, it was definitely worthwhile to pursue the assumption that those would be the names or Pharaohs. He was right, and that hypothesis took him a long way toward his goal. So, here is what the name of our friend, Akhenaten looked like in hieroglyphics. Third, all of this may be a little excessively esoteric. You probably just want the basics for everyday use. You want to know, for example, if you're walking down the street in a crowd of people, if anyone around you is a Pharaoh. As you step into the waiting room at the doctor's, you don't want to fail to acknowledge any Pharaohs sitting there. So, here's a drawing I made of your basic Pharaoh. Although I obviously used pictures of real Pharaohs as models, this is not supposed to be anyone specific, just your basic Pharaoh, as he may be sitting two rows up from you in the movie theater. On his uneasy head there rests a crown. He may be wearing different ones, depending on the circumstances, but the most important one is the Uraeus, the crown that combines the symbol of Lower Egypt, the cobra, with the symbol of Upper Egypt, the vulture. Each of these pieces was originally a representation of the official goddess of the two areas watching over her realm. 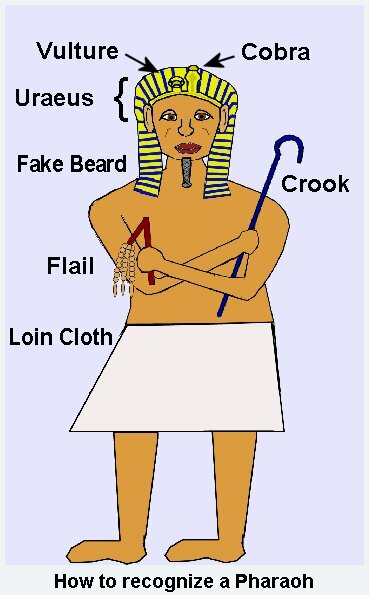 As we mentioned already, a Pharaoh was depicted with a fake beard, and even Queen Hatshepsut wore one in her depictions. At his accession, at other crucial appearances, and in his grave, the Pharaoh carries two implements, whose superficial meaning is clear, but the reason why they have become symbolic of the Pharaoh's authority not so much. He holds a flail, an object of punishment, which is fairly straight-forward, and a crook, much like a shepherd's tool. Finally, apparently wearing the plain white loin cloth is restricted to Pharaohs, though maybe sometimes it could also be worn by high nobility. So, as we were saying, at the beginning of the eighteenth dynasty, thanks to the efforts of Thuthmosis I and III in particular, Egypt was the big boy on the block. At the time, they had conquered the entire Levant, reaching all the way to the Euphrates, turning the various states into tribute-paying vassals, who were overseen by three Egyptian representatives. There were the larger nations further out: the Hittites, the Mittanites, the Assyrians, and Babylonians, among others. Mittani is not well known today, mostly because it was obliterated by the Hittitites; it was one of Egypt's stronger enemies at one time, and one of the big surprises in Amenhotep II's sudden move toward peace occurred when hestopped fighting against Mittani. Then there were all of the little small kingdoms, the city-states of Canaan, each of whom wanted protection and gold from Egypt, and most of whom wanted to be just a little bit bigger and stronger than their neighbors. The jealousies and rivalries became exacerbated with the influx of the Habiri, nomadic people who broke into the land, took over cities, and settled in as though they owned the country. Let me be clear on this: I am in no position to dispute the apparent consensus that Habiru ('apiru) was not a proper noun, at least at first. The facts are far too complex and contrary. Then again, that is about where the consensus ends. There are many theories concerning the identity of the Habiri, ranging from the idea that they were the objectionable fringe element of the various cities and states to their being mercenary soldiers to their constituting independent nomadic groups wandering in and out of geographic regions. Chances are that the term was applied in all of these ways and others at some time, with the third usage mentioned perhaps dominating. In that case it appears to have been a general term referring to groups of people who came into settled regions and squatted there for a time, making a nuisance of themselves by reaping where they had not sowed, letting their animals graze in pastures they did not own, and helping themselves to the property of local dwellers when they were in need of various items. Abraham would technically have been considered a Habiru, though a very well-mannered one. It is likely that he was called ibri (a "stranger" in a slightly different dialect), and that this eponym stuck with his descendents, giving rise to the designation "Hebrew." Thus, in this case, an ibri would qualify as a Habiru. However, by the time of the Amarna tablets, the Habiri had become a major problem on a totally different scale; they were overrunning the country in a huge mass, actually pursuing an organized military campaign, and they had not come for a temporary visit. They intended to take over and stay. There is, of course, a tradition of denial that the Habiri of the Amarna tablets were the conquering Hebrews of the books of Joshua and Judges. We shall look some more at this issue in the next entry. For now, let me raise a rhetorical question that seems to me to scream for an answer: If this large group of Habiri mentioned in the tablets are not the Hebrews, who were they? Given the scale of the conquest they were undertaking, we would be looking at two invasions of Canaan, roughly at the same time. We know of that of the Israelites. The idea that there was another large organized group that, right about then, was also conquering the Promised Land and the identical cities that the Hebres were taking over, but whose identity is unknown to us, appears to me to stretch plausibility a bit. More on the tablets next time. Well, not literally on the tablets. On the blog. About the tablets. What a beautiful day we were blessed with today! Sunshine, just the right temperature, an ever-so-slight breeze. By now all the trees are in flower, and Indiana has once again become livable. As I was sitting upstairs in my study this morning, putting the last few sections of the article on Akhenaten together, June called up to me to suggest that, at a minimum, I should move outside with my laptop in order to take advantage of the weather. I more than happily complied, and also did a little bit of yard work. So, today was the opening day of my outside office, the picnic table located on the concrete slab behind the garage. Let us return to the so-called Amarna tablets, which were found in the remnants of Akhetaten, in what is now believed to have been the office storage room of the scribes. They are clay tablets with cuneiform inscriptions, most of them in a rather awkward and somewhat archaic version of Babylonian (Akkadian), the common international language of the time. It's amazing how much information one of those tablets can hold. But think about this: Other than the Babylonians, Akkadian was not the native language of any of the many correspondents, which included among others: Hittites, Assyrians, Canaanites, and, of course, Egyptians. And even for the Babylonians, the language used was not their usual way of speaking or writing any longer. Look at the Egyptians in particular. 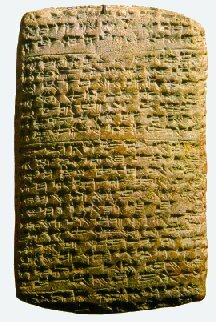 Cuneiform tablets were about as far from their usual method of writing letters as they are for you and me. We write (or at least used to, prior to e-mail) on paper in a totally different script (the "Roman" alphabet") in a totally different language. Same thing for the Egyptians. Normally their scribes would write on papyrus in hieratic (a cursive form of hieroglyphics) in Egyptian. So, these tablets must have been placed into that room at some stage before or after translation, and the tablets originating from the Pharaoh, who was required to be literate in the Egyptian language, but probably not Pidgeon-Akkadian, must have been drafts of translations prior to their being sent. The process was somewhat cumbersome, and a very precise protocol in address was required, recognizing the pharaoh as occupying the top of the hierarchy, though the major rulers addressed each other as "brothers," while the small Canaanite vassal princes just barely seemed to count in the circle of humanity. Their salutation to the pharaoh included the standard phrase that they prostrated themselves before him on the ground seven by seven times. I imagine that at home these petty mayors who called themselves "kings" had their own subjects roll in the dirt before them 49 times or more as well. Bullying tends to be hierarchical. The process of sending tablets, by the way, was by messengers who enjoyed a kind of diplomatic immunity as they crossed various borders--unless they carried valuables, in which case they were frequently targeted by robber bands. Unkind tongues whispered that some of these "robbers" were in service to other princes. The Amarna tablets give us unique insights into the conditions of the Near East in the fourteenth century BC. The very first one in the official collections (designated EA 1), is a defense by Amenophis III (Akhenaten's father) against insinuations made by the king of Babylon, Kadashman Enlil. Clearly, there was a lot of exchange of princesses among the various rulers in order to cement alliances, but the Egyptians gave themselves an exemption from this policy. The pharaohs were happy to receive women from other countries to place into their harems; in fact, they practically insisted on it, but they took a firm stance against an Egyptian princess ever being sent to another king to become his wife, as expressed rather tactlessly by Amenophis III in EA 5 (Solomon may have been the only exception to this rule [1 Kings 7:8], though at that time Egypt was at a serious low point in international standing.) Instead, Egypt was expected to send lots of gold to the other kings because "Egypt has as much gold as dirt," as the saying went, and to protect its vassal states with its military power. Clearly, Egypt had broadcast neither the drowning of its army in the Red Sea nor that its growing replacement consisted to a large part of unreliable mercenaries. Furthermore, as far as Akhenaten was concerned, he needed the army to work on his building projects and to enforce the changes he mandated within his country. As an aside, in the Amarna script and language, of the various correspondents and other people to whom they refer are rather dissimilar from the ones in the Bible in Joshua and Judges, and it could be said that this fact alone erases any possibility of a parallel between the Bible and the Amarna tablets. But such a judgment would be far too premature. For one thing, it is a fact that frequently in different languages, names are radically different. I learned the name of the country in which I was born as Deutschland, whereas in other languages it goes by radically different names, e.g. Germany or Allemagne. Furthermore, the kings and princes used their given names, not their royal or princely epithets in addressing each other. Thus, Amenophis III is usually called some variety on Mimmuwareya and Akhenaten is addressed as Naphurureya. Given the fact that we can be completely sure of these two cases, it stands to reason that a similar phenomenon is true for other cases, and an argument based on differences in names does not have a foot to stand on--unless one can prove that the use of one name in one piece of writing (biblical or from the tablets) logically precludes the person going by a different name in another piece. To return to EA 1, the saucy note from Amenophis to Kadashman Enlil of Babylon. The latter had sent one of his daughters to Egypt to become one of Amenophis's multitude of wives. Now rumors were in the air that the girl had died. When KE sent an emissary to Egypt to check on the situation, a woman who was supposed to be the bride was paraded before him, heavily attired and without speaking. The report by this emissary strengthened the Babylonian king's suspicions. Furthermore, KE was pretty unhappy that Amenophis had not sent him his daughter in return nor, for that matter, had given his representative a huge amount of gold as a present. So, the air was tense between Egypt and Babylon. In the draft of his reply, the pharaoh took on the air of a man with wounded feelings. He lamented that the king of Babylon had succumbed to unfounded and somewhat mean-spirited suspicions. However, in the light of other shenanigans by him and his son, we cannot rule out that the Babylonian princess might have died in Egypt, and, of course, the pharaoh would never admit to such a calamity. Remember the standard ancient Egyptian way of dealing with problems: Do not record them and act as though they never happened. The messages that Tushratta, king of Mittani, sent to Egypt are on similar theme. His series of tablets actually begins with EA 17, directed to Amenophis III, but they start to take a very different twist with EA 26-29, which are all written (dictated) by him concerning his dissatisfaction with the Egyptian court. He had sent his daughter Tadu-Heba to Egypt to Amenophis III (who goes by variants on the name Mimmuwareya in the tablets). She, too, was slated to become one more of the pharaoh's many wives. But there is a complication here because apparently Amenophis died soon thereafter; the marriage had taken place, and so the girl passed into Akhenaten's "possession." Tushratta sent two enormous sets of treasures to Egypt as signs of good will and as a dowry (EA 22, 24). He also passed a necklace on to Amenophis that was supposed to lengthen his lifespan by 100,000 years (EA 21--that's one lakh of years for my Indian readers), and delivered (a statue of) the goddess of Nineveh on temporary loan. In return, one part of the bride price from the pharaoh was supposed to have been two statues made of solid gold. Tushratta claimed that his messengers had observed their production in Egypt at the time, so he knew that they existed. However, when they, or rather their substitutes, arrived at the king's palace, they turned out to be merely made of wood that was overlaid with gold. There had been previous incidents, where a king accused the pharaoh of cheating him by sending a very low grade of gold, but this deception would have been far worse than anything that had been perpetrated before and would have taken the coarsely ground wheat bread a prize. Apparently, Tushratta believed that the person behind the fraud was Akhenaten (known as Naphurureya in the tablets), the successor to Amenophis. Tadu -Heba was definitely in an uncomfortable position since her new "master/husband/owner/whatever" had not finished paying the agreed-upon bride price. How awkward was Tadu-Heba's situation? Just look at to whom Tushratta first wrote when he felt defrauded! His first tablet, as inventoried today, went to none other than another wife of Amenophis III, specifically his Chief Wife, Tyie by name. He stated to her that she should be able to recall all of the details of the negotiations, and that she should inform her son, Akhenaten, to make it right. Whether Akhenaten's queen mother actually had any real power at the court is, like everything else, a topic of debate, but it should appear that Tushratta would not have called on her as witness if she had not, indeed, been a negotiating partner to this scheme, perhaps the last of her late husband's marital additions. Setting a pattern for Solomon centuries later, Amenophis III apparently collected wives the way other people today collect postage stamps, and I will leave it up to you work out possible analogies. Perhaps simultaneously, Tushratta also sent a tablet to the new pharaoh, telling him that his fraud had been discovered and that, if he had any questions, he should consult his mother, who would verify his claim. Two more tablets about the same matter followed. The last one (no. 29) detailed a sizeable number of complaints that Tushratta had against "his brother" Akhenaten. 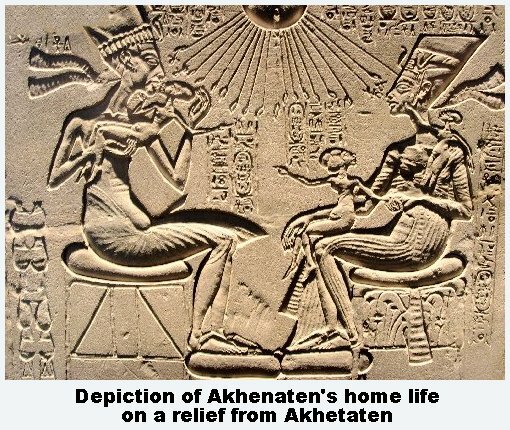 It is highly unlikely that Akhenaten did anything to remedy the situation. Not too long thereafter, the Hittites took over the kingdom of Mittani and executed Tushratta, and Egypt remained on the side line. ---I'm not nearly as far along as I wanted to be before posting this entry, but I'm too tired, and so I'm going to carry on this topic just a little longer. Next time we will definitely get to the Habiri, and we can't possibly leave off this set of chips from the workshop without discussing the issue of Akhenaten's successor. I'll add the navigation links tomorrow as well. Hang in there. 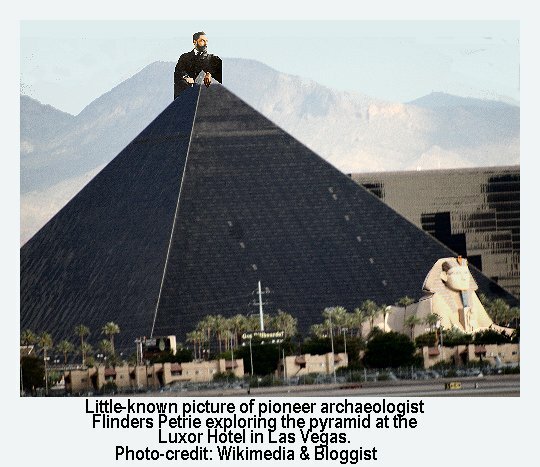 The pyramids have been waiting for these blogs a lot longer than you and I have. Win and June are out of town again, pursuing certain obligations. Additionally, I've been too occupied with the article on Akhenaten and other matters to gather chips to post on the blog. Did I really say last Wednesday or so that I was putting together the last sections of the article? I guess a little optimism is a good way to keep yourself going. It turned out to be late Sunday night (or really 2 a.m. Monday morning), that I finally hit the "send" button, so that it would find its way to Logos. On Monday morning I had some other matters to clear up, and, then, once again, we loaded up the Dodge Dakota to pursue some tasks of a different kind of importance. As I said, it wouldn't be right for me to reproduce the article or its specific content for you here, but there still are plenty of chips off the workbench that I can share with you. Before proceeding, I must make a couple of important points, lest you be misled. As I am frolicking along here giving you my interpretations of the eighteenth dynasty of Egypt and stressing how it relates to the Exodus, please do not fall into the trap of thinking that this is easy stuff to master. There are many relevant issues that I'm neither raising nor answering here because this entry is not intended to be a deeply technical discussion. But If you rely on what I am writing here alone, you will soon find yourself with a whole new set of questions for which I believe I know the answers, but can't get into without risking a severe shrinkage in readership. I fear that nobody would read the blog if I crammed it full of alleged Egyptianisms in the Pentateuch, interpretations of artifacts, etc., items one can and should study from existing books. I already mentioned that my interest in ancient Egypt began with receiving a copy of C. W. Ceram's Götter, Gräber und Gelehrte (Gods, Graves and Scholars) as a Christmas present, and, though I did not become an Egyptologist, I have maintained a serious interest in the subject. (I know, someone might point out to me that I have maintained a serious interest in perhaps too many different subjects, and--for good or ill--they could be be right.) When I took the course on Old Testament Introduction from Gleason L. Archer, he had us memorize even the tiniest minutia shedding light on the date of the writing of the Pentateuch and of the Exodus, e.g. words in the original biblical text that are consistent with an Egyptian origin. What are the clear results and liabilities of Nelson Glueck's archaeological survey of the East Bank of the Jordan? Etc. I am mentioning these things because I hate to think that anyone would simply use what I have written here and believe that they are now equipped to tackle the world of the history of Egypt. I believe that every word I'm writing is true or the most plausible option, but in many cases it's hard-won territory, which I'm giving you for free without the struggle. Which, of course, brings me to my constant lament: Where are the successors to, say, Archer and J. B. Payne, evangelical scholars who held to the full sense of inerrancy, and who were capable of engagement with the source material on the primary level? (Actually, I trust that we all realize that "full inerrancy" is a redundancy, and that "partial inerrancy" is incoherent; a relativized universal is no longer a universal, and "inerrancy" expresses a universal property of the Bible). I have stated aggravatingly often over the last few years that I believe that evangelical seminaries need to seriously consider adding Sanskrit to their curriculum for, loosely put, purposes of apologetics. But I have always said at the same time that I would not want one hour less of ancient languages offered or taken. Maybe more. I would love to institute an ideal seminary curriculum; it would look very different from the common compromises--and few people would take it. Anyway, let me just mention by title Gleason Archer's Survey of Old Testament Introduction. For his course, all one had to do was to memorize the book and apply its content to an article written from a liberal point of view---hah! Not so hard if you had a photographic memory. Also, while we're on the Amarana Tablets, if you've never looked through James B. Pritchard's Ancient Near Eastern Text (ANET) or his abridged Ancient Near East: An Anthology in Texts and Pictures(ANETA), you may be in for a surpirse on seeing how much of Old Testament history is mirrored in contemporary writings by its pagan neighbors. The Armarna tablets are found in ANET, as well as excerpts in ANETA. A different translation compiled by William Moran is found in the Logos collection, originally published by Johns Hopkins Press in 1992. I'm sure there are many other good places to start. Mine lie here. So, I left off last time by mentioning the snitty attitude that Akhenaten manifested toward his "brother" kings. The Canaanite princelings (some translations call them "mayors; the OT calls them "kings"--I would call them "fawning autocrats on insecure thrones"-- were by and large not asking for gold from the pharaohs; they could count on not getting any. They begged in the most embarrassing terms for the Pharaoh's military assistance. The Hittites were spreading their elbows into Syria and--as mentioned above--eventually wiped out Mittani. The Canaanites took advantage of any possible opportunity to gain power over their colleagues, forming and breaking alliances to suit their needs. The following is copied and pasted from my present totally ad hoc collection on this topic, more specifically entitled, The Chronology of Judges, which this series will replace, but which I may yet keep accessible somewhere. Among these letters we find an appeal from Shuwardata, prince of the greater Hebron metropolitan area to Akhenaten, begging for military help against the Habiri. He claimed to have "smitten" the Habiri' leader, but this seems to have been a fairly dubious claim since he was still continuing to lose territory to the Habiri in the process, and he was going on to fight the Chief of the Habiri. And, by the way, again the idea of a single "Chief of the 'Apiru" does not fit in with the picture of Habiri as disorganized marauders. Here is a part of this letter. Indeed, ask Ben-ilima, ask Taduwa, ask Yashuya! A major hindrance in some parts of Near Eastern Studies, including Egyptology, is the way in which debatable assumptions have metamorphosed into axioms. There is nothing new in that observation, of course, and I'll try not to flog that poor equine too badly. Still, you may find it interesting to see specifically how such assumption have manifest themselves in this area of study on Egypt and the Bible. Pictures and navigational aids later .... And the series must continue. "The plethora of attempts to relate apiru (Habiru) to the gentilic ibri are all nothing but wishful thinking." Let me explain that ibri is "Hebrews" in Hebrew ( though strictly speaking it should be ibrīm), and that the word "gentilic" has nothing to do with being either gentle or a Gentile, but that it refers to the regular residents of a particular area. His point then, if I understand it correctly, is that the Hebrews were already resident in the Levant prior to the Amarna era, and that, therefore, they do not qualify as "Habiri." If they came after the Amarna era, "gentilic" would be just plain a wrong word. This statement illustrates nicely my advice for writing scholarly papers (which blog entries are not): one is better off understating one's conclusions than to state a conclusion with so much weight that it becomes indefensible. Here we have a case in point. The evidence for a Hebrew presence in Canaan prior to the Exodus and Conquest is minimal, and if it can even be demonstrated (of which I'm not sure), it can easily be accounted for by the fact that, once having come down to Egypt during the drought under Joseph, not every Israelite stayed tied down there. It would be a while before they were enslaved, and, prior to that time, some Hebrews moved back and forth between Canaan and Egypt (see 2 Chronicles 7:20-23). But furthermore, this is a good opportunity to consider a "heads-I win; tails-you lose" argument. This is the kind of argument in which you grant the skeptic all that he asks for that is not just plain absurd--hypothetically and for the sake of the argument. Then you show that, even on such a minimalist basis your case still stands up. Let's see what minimal information we have that still shows that the classification of the Hebrews among the Habiri is not simply an act of wishful thinking. 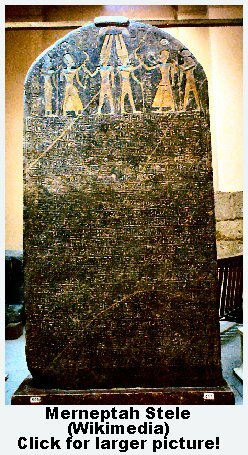 Pharaoh Merneptah (ruled 1213-1203 BC) stated in his famous stele recounting his alleged victories: "Israel is laid waste and his seed is not." We can, therefore, infer that a people known as Israel were present in Canaan by that time. "Israel" constituted a recognized comprehensive whole or social unit that was covered by a single term, whether as a collection of cities or allied nomadic tribes we can leave open here (for the sake of this argument). The point is that the term had a specific referent as a proper name; it was not a general collective word like "people". The phrase, "Israel is laid waste; his seed is not," is not a metaphor regarding the decimation of the people. It does not refer to Israelites of their offspring being killed, but straight-forward to the destruction of their fields and their grain. Now, I understand that the hieroglyphics used to designate Israel in this case are more often than not used to refer to nomadic people. However, from my limited knowledge, I believe that they can also mean "foreign" or, in an extended sense, "newcomer." Now, if I wanted to understate the next point, I would say something like, "There is good reason to believe that in this case the designation should best not be translated simply as 'nomad.'" But putting it that gently is granting the opponent in the debate far more than he is entitled to, even if we make reasonable concessions. The designation cannot mean "nomad" here, not if Israel was growing their own crops. Here's the crucial point: A single people group cannot be both nomadic and agricultural. A nomadic group, by definition, moves from place to place, usually herding animals, such as cattle or sheep. Much of the time they have an annual circuit that they follow, depending on where there is sufficient plant growth and water. The yearly cycle may even include an annual operation of stealing other people's grain, as exhibited by the Midianites, as described in Judges 6:1-6. And, for that matter, I'm not going to rule out that a certain group may return to specific places where they can expect some edible food to grow, a form of economic survival known as "horticulturalism." Just to round out the possibilities, there are also "pastoralists," who keep animals in a settled area, switching permanent meadows surrounding a village from time to time. But, again by definition, they do not grow grain. However, it is not just a convention in anthropology text books, it is a physical reality that a people cannot be both nomadic and agricultural. They may have been nomadic when they first came to the notice of some people, and thus the designation stuck as "strangers" and "newcomers." But Mereneptah doesn't seem to leave any doubt that he engaged in the ruthless practice of bringing famine to a people by wiping out their crops and making sure that they had no grain to replant next year. That way the subjected people will surely be obedient and reliant on their conquerors. (It never ceases to amaze me what people are capable of for the sake of nothing except to do harm to people simply because they can.) For us, that means that by this time the Hebrews had already made the switch from being sheep herders to crop growers. But to engage in regular agriculture, you must be settled into a particular spot. There were no part-time farmers back then who would return in the evening from their full-time job and quickly disk the back twenty acres by the light of the latest enclosed-cab tractor. Regardless, the notion of "nomad by day and farmer by night" is ludicrous anyway. But where were the Israelites before Merneptah? It doesn't matter what explanations one may want to bring up, they must have been somewhere. From a purely logical point of view, they either had been residing permanently in Canaan as a recognizable group, or they were wanderers who entered Canaan at some time as a group with its particular identity. The first option, that of Israel being long-time permanent residents of Canaan by the time of the Amarna letters leaves us with the problem that, outside of the highly ambiguous and unexplained references to ibrīm, there is nothing to go on in support of that notion. They did not reside in any cities or hold any territories that we know of. They would had to have existed anonymously under an invisibility cloak, as it were, and that's not a good hypothesis. The best that we can do is to say that they must have been among all of the various nomadic groups that came and went in Canaan, though apparently eventually they came and didn't go. And thus, we have no choice but to place them right back among the Habiri by definition. This is not wishful thinking; it is purely a matter of trying to account for the fact that, they were unknown at one time, and then at some time or another (still going with this minimalist argument) they showed up as a political unit. Now, as we read the Amarna tablets, we find that some of the Habiri took over some of the very cities that the Hebrews conquered. In fact, as I stated earlier, one cannot get away from the fact that at least some of the Habiri of the Amarna tablets were very different from the usual Habiri because this group was nomadic only temporarily. They very definitely intended to take over land and cities and to settle down, and so they did. At the risk of stating an argument from silence, it could be considered significant that the princes of the cities that the Hebrews took at the very beginning of the conquest, such as Jericho, never sent any messages to Egypt. They were under "Habiru" control already. Thus, contrary to Rainey's claim, apart from the invisibility-cloak theory, we really do not have much of a choice but to recognize that some of the Habiri mentioned on some of the tablets must have included some of the Hebrews. 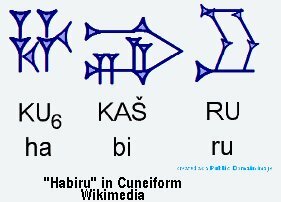 I'm not saying that "Habiru" and "Hebrew" are synonymous, though "Ibri" and "Hebrew" are. 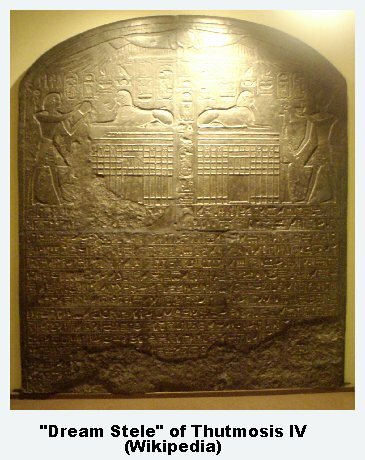 However, it is an overreaction to claim that the "Ibri" and their conquest of Canaan were not the stars of the Habiri featured in the Amarna tablets. Now, of course, I'm willing to go a little further. It seems that the Amarna tablets, among other things, provide a rather graphic Canaanite record of the Hebrew conquest, but even a minimalist assessment cannot get away from the fact that the Israelites were among the Habiri of Amarna fame. Now, I said in the last entry that I wanted to show how "debatable assumptions" had "metamorphosed into axioms," and I also promised not to flog that horse too badly. What I meant is that I'm not going to bring up example after example of how Egyptologists have either ignored or even sought to undermine the biblical record. That's a "dog-bites-man" story, which we don't need to expand on. I'll just mention one really minor item that struck me in Cyril Aldred's Akhenaten: King of Egypt (1988), and it is probably as much subjective as objective. Aldred, once one of the leading scholars of ancient Egyptian culture, lamented extensively about the way in which grave robbers--ancient, modern, and in-between--have destroyed so much of Egyptian art. He minces no words in condemning those who did it and what they did. Still, it caught my eye when he described the modification of an ancient tomb by Coptic Christians into a church building as a "desecration," a word that he does not use for the senseless immolations and acts of destruction carried out by others. I cracked up laughing when I saw that. Robbers apparently are bad, but Christians who convert a pre-robbed tomb into a church are worse; they are desecrators. But for this moment I'm most interested in the scholarly theories that may be religiously or ideologically neutral that still take on a life of their own and persist as given assumptions even after their usefulness as scientific hypotheses has been exhausted. Let me give you an example as a chip from the article I wrote; for details, you must wait for the article. A few entries ago I gave you a chart of the pharaohs of the eighteenth dynasty. According to that chart Akhenaten was succeeded by Smenkhkare, who ruled for a few years before passing on and leaving the throne to Tutankhamun. The debate about Smenkhkare's identity is going to go on for a long time. His existence as a young man who ruled Egypt for a few short years has, indeed, become axiomatic in some circles. But there is now more evidence than there had been, oh, last year around this time, not to mention thirty years ago. In my comments in the chart I said, "Mysterious successor to Akhenaten and possibly co-regent. He and the appearance of his mummy have long been a puzzle to Egyptologists. I can't wait to tell you about him!" Now I get to tell you about him. Reading about Smenkhkare is like reading about Melchizedek in the book of Hebrews: "without father, mother, or genealogy, having no beginning of days . . ." (Heb. 7:3, amended) We know that he had an "end of days" because we know that he died, and his mummy has been found and identified, or so many people have thought. But, other than that, he's a ghost-like figure who suddenly apparates next to Akhenaten, and even becomes pharaoh for a time. I cautioned you not to take the chart as final, which no chart of the eighteenth dynasty can be, realistically speaking, even after the addition I'm providing here. Let me tell you the direction into which scholarship is heading with Smenkhkare. First of all, the name will not be eliminated from the succession of pharaohs. However, we need to rethink the identity of the person behind the name. Let me give you a clue: Nefertiti, Akhenaten's Chief Wife, disappeared from the records around the same time as Smenkhkare began to appear. First we see him under a different personal name (Nefertuaten), which he just happened to share with Nefertiti; then he became ruler under the epithet of Smenkhkare along with the very names that Nefertiti had also held previously. So, saving the evidence for what will be in print (or in response to personal questions), this is the theory that is becoming increasingly accepted. Smenkhkare is none other than Nefertiti herself. Contrary to what was conventional wisdom for a long time, she did not disappear in Akhenaten's last five years, but became co-regent and pharaoh herself, ruling alone for approximately four years after Akhenaten had died. During that time, the duties of "Chief Wife" befell her oldest daughter Meritaten, while Nefertiti (now Pharaoh Smenkhkare) was fairly desperately looking for a man of appropriate standing for her and Meritaten, even appealing to the King of the Hittites to send a prince. Alas, the Hittite prince was assassinated on his way down to Egypt, Nefertiti died, Meritaten became superfluous, and the throne went to the new pharaoh, Akhenaten's son Tutankhamun ("King Tut") and his lovely bride, the new Chief Wife, Ankhesenamun. And, oh yeah, the mummy of which many people were convinced that it belonged to the mysterious Smenkhkare is most likely that of Akhenaten himself. Please, remember once more that this is the short-short version, arising out of debates on minuscule points, and including data that are less than a year old. 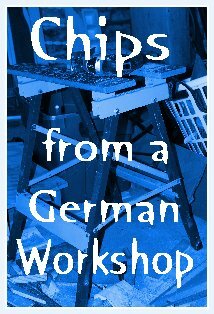 I trust that you have enjoyed this set of "chips from my workshop." This concludes this series unless there are questions of sufficient weight or number to warrant extending it some more. This invitation continues to apply even though it's not a blog section any longer. Anson F. Rainey, "Unruly Elements in Late Bronze Canaanite Society," in Pomegranates and Golden Bells, ed. David Pearson Wright, David Noel Freedman, Avi Hurvitz, (Eisenbrauns, 1995), 483.